Unknown to the Yankees, their fans, and Bob Sheppard at the time the "Voice of God" worked his last game as the team's P.A. 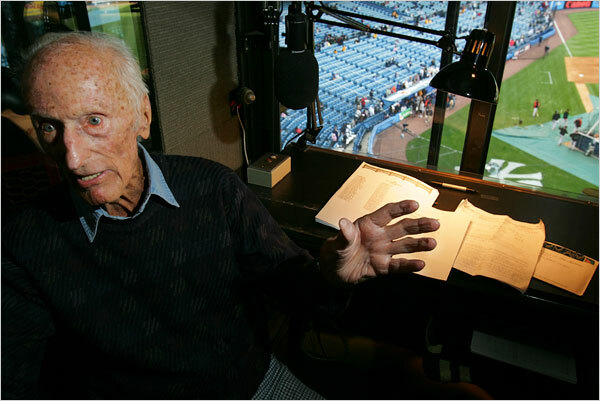 announcer at Yankee Stadium in 2007. This was Sheppard's 4,500th time since taking over the job in 1951. Jim Hall and Paul Olden would replace Sheppard when the team moves to the new Yankee Stadium in 2009. During the game Alex Rodriguez became only the fourth player in Yankees history to hit a home run twice in the same inning. What made this 10-2 victory over the Seattle Mariners even more spectacular was the fact that A Rod had gone to the hospital to have his sore right ankle examined and had to talk his way into the lineup before the game. Also on this day in 1989 Deion Sanders, the Yankees rookie, hit a home run as the Yankees routed the Seattle Mariners 12-2. Five days later the rookie Atlanta Falcons player would make his NFL debut and would return a punt 68 yards for a touchdown. #Athlete.